Born and raised in Frederick County, John was interested in art from a young age. Like many tattooers of John's generation, he was influenced by skateboard graphics, Album art, and graffiti. ​In 2005 John began apprenticing a classic Electric Tattoo. Working in a street shop helped round out his skill set, leading to proficiency in multiple styles. Branching out through conventions and guest spots invoked a desire to relocate and learn from other artists. Coinciding with the birth of his first son in 2011, John and his family decided to move to Akron Ohio. His time in Ohio was inspirational and provided a renewed sense of purpose. John eventually decided to return to Frederick and in 2013 welcome his second son. After years of honing his craft, John has developed an appreciation for multiple styles, specifically designs of a traditional vernacular, both Eastern and Western. With an eye for old-school aesthetics- bold lines, black shading, bright colors, he enjoys doing anything from walkin style tattoos, to large scale custom pieces. Gary Gerhardt started tattooing in 2006 after completing a 2 year apprenticeship at Little Vinnies Tatttoos in Baltimore, Md. He worked at Little Vinnies Westside location (a high volume walk in / street shop) , where he learned multiple styles of tattooing. 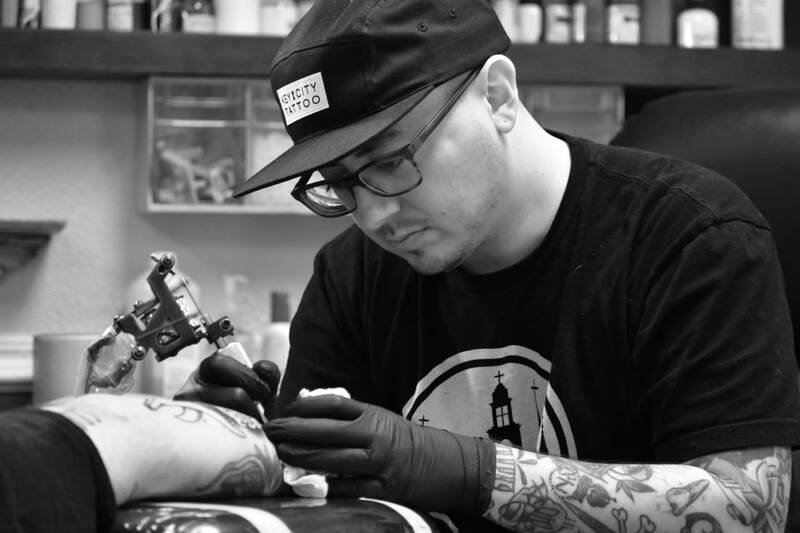 Gary enjoys anything from the simplest walk - in style tattoo to large scale custom work. He also enjoys script lettering, black and gray and american traditional. Gary tries to be able to do whatever walks in the door. After Vinnies, Gary worked in San Diego, California and then eventually moved back to Maryland, where in 2014 he got the opportunity to work along side some of his favorite tattooers at Classic Electric Tattoo. Now in 2017 He has partnered with fellow artist and good friend John Rippey to bring you Key City Tattoo!! Nate Sprenkle was born and raised in York Pennsylvania. With an artistic eye from an early age Nate soaked up inspiration from movies and sports. Moving to Philadelphia after high school Nate graduated from Tyler School of Art with a BFA degree in Printmaking and Painting. Apprenticing under Drew Rash at Glenside just outside of Philadelphia. Drawn to bold traditional tattoos and anything pop culture related Nate continues to grow as an artist and tattooer. Enjoying custom tattoos as well as any walk-in. Antonio was born and raised in the eastern panhandle of West Virginia. He has been interested in drawing and painting his entire life and became interested in tattooing at a very early age. He briefly studied art/graphic design Shepherd University. In 2007, he started an apprenticeship in Ranson, WV where he developed his own take on traditional tattooing while also taking on all styles of walk ins. After 5 years of tattooing in his home state, he took the opportunity to move to Frederick, MD where his clientele grew to include a wide range of tattoo collectors visiting from across the US and other countries. His work consists of custom traditional, black and grey, and single needle fine line tattoos.